The Houston Fire Department and the Care Van program are providing FREE immunizations to UNINSURED and MEDICAID children. They cannot service children with CHIP insurance. All children must accompanied by their parents or legal guardian and bring current shot records. The free immunizations are today, Thursday, August 16, 2018 from 4 p.m. – 6:30 p.m.
Over this past sales tax holiday weekend, some 25,000 students got a head start with free school supplies at the Eighth Annual Mayor’s Back 2 School Fest on Saturday, August 11th at George R. Brown Convention Center. 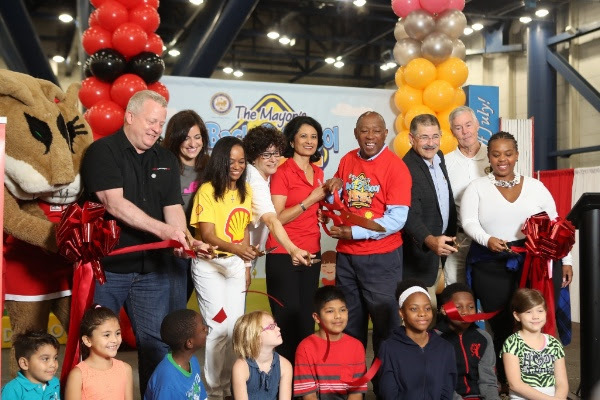 Mayor Sylvester Turner and University of Houston President Renu Khator welcomed thousands of students and their families to the Eighth Annual Mayor’s Back 2 School Fest. The annual festival provided Houston elementary school students from low-income families with free school supplies, immunizations, health screenings, haircut vouchers, underwear and other items. The festival also connected families to health and social services. One in 4 Texas children live in poverty, the city says, and the Mayor’s festival’s goal was to help change their futures in school. “As Founding, Presenting Sponsor, the Mayor’s Back 2 School Fest demonstrates the power of community, education and business working together to improve outcomes in student achievement,” said Frazier Wilson, Vice President, Shell Oil Company Foundation and Manager, Workforce & Diversity Outreach. This year’s festival also displayed the Texas Alliance for Minority Engineers, (TAME)Trailblazer with STEM activities managed by Shell technical experts and Shell’s award winning Number 22 NASCAR. The innovative racing simulators also excited the students who attended the Back to School festival. “It is important that our young Houstonians go back to school healthy, prepared, and ready to learn. We hope their visit will inspire them to focus, study hard, graduate, and then come back and become Cougars! We are especially happy to note that Mayor Sylvester Turner is a UH alumnus, and we are proud to partner with him and the City of Houston on this important annual event” said UH President Khator. Advance registration was required to attend the festival. If your family was unable to attend the Mayor’s Back to School Festival, call the 2-1-1 United Way Helpline for referrals to community agencies offering back-to-school supplies and assistance. This entry was posted in Asian Community Houston, Community Events, Education, Houston News and tagged Back to School Festival Houston, Free Back To School Immunizations 2018, Free Houston Back to School Immunizations, Mayor Turner's Back to School Festival. Bookmark the permalink.